Team Up is coming out on February 2nd and is legal for Australia’s IC which is Standard and St. Louis Regionals which is also Standard. I’ll be looking at the upcoming Standard Format with Team Up included and talk about observations and theories I have made while building decks, testing, and looking at the current meta in Japan. Alolan Muk SUM is going to have heightened potential in Standard Format when Team Up becomes legal. Cards like Marshadow-GX, Marshadow SGL, Ditto Prism Star, Giratina LOT, and Tapu Lele-GX are pre-existing reasons to play Alolan Muk, but with Team Up comes basic Pokemon with strong abilities like Jirachi, Tapu Koko Prism Star, and possible increased usage of Marshadow-GX to copy strong Tag Team-GX attacks. I hypothesize that this increased deck inclusion of Alolan Muk along with more single prize attackers to choose from will drive Granbull out of the meta as Granbull thrives off of using Oranguru SUM to draw cards and is aided by Ditto Prism Star (both of these cards’ abilities are shut off by Alolan Muk). Previous to Team Up, Alolan Muk was often included in lists without an Alolan Grimer to evolve from, having Ditto Prism Star as its only route to hitting the board. Alolan Grimer should start to see more play because of Alolan Muk’s increased potential. I am anticipating a decline in Field Blower due to new Prism Star stadiums and Thunder Mountain Prism Star becoming more powerful with the new set. Remember that Prism Star stadiums cannot be removed by Items or Supporters, so Field Blower can not be used to remove them. Stadiums should be replacing Field Blower slots in lists that want to be able to remove opposing Prism Star Stadiums (like Black Market Prism Star and Wondrous Labyrinth Prism Star) from play. As always, there are weaknesses to capitalize on when a change is made to counter a new threat. This hypothesized decline in Field Blower coupled with an expected decline in Decidueye-GX variants could result in Spell Tag from Lost Thunder becoming a more viable Tool. The decline in Field Blower would benefit other passive tools like Metal Frying Pan, Choice Helmet, and Buff Padding (from Team Up) as well. I am expecting Decidueye-GX variants to be underwhelming in Sun and Moon-Team Up due to Tag Team-GX Pokemon having HP that is out of reach compared to the average GX Pokemon Decidueye decks were previously able to handle. Jirachi from Team Up is a very useful new card for old archetypes like Psychic Malamar and Ultra Malamar, and new archetypes like Zapdos Variants and Doublade Tool Drop. Absol from Team Up is a great basic Pokemon tech for opposing Jirachis as Escape Board’s retreat cost reduction will be countered by Absol’s ability. In my opinion, the following archetypes are in the running to be established as Tier 1 or Tier 2 decks once Team Up is legal: ZoroRoc, Psychic Malamar, Ultra Malamar, Passimian, Zapdos variants, Pikachu Zekrom Tag Team-GX and friends, Zoroark Control, Venasuar Celebi Tag Team-GX, Vika Ray, Gardevoir/Swampert/Ninetales/Solgaleo/Nidoqueen/Meganium, Blacephalon, Lost March. Decks on the fringe of this list that I would put at rogue status or likely Tier 3 are Spread Malamar, Zoroark Weavile and/or Alolan Ninetales-GX LOT, Doublade Tool Drop, Aerodactyl Malamar, and Stall variants (such as Wailord Magikarp Tag Team-GX, Hoopa SGL, Xurkitree-GX, Regigigas, etc). Three ways I see to build a deck with Zapdos from Team Up include Zapdos w/ Shrine of Punishments and other single prize attackers, Zapdos w/ Jolteon-GX, and a Pikachu Zekrom Tag Team-GX focused deck that also uses Zapdos. At first glance, I thought the Zapdos variants were going to turn out to be too underwhelming. Zapdos hits 80 damage for 1 energy if it was on the bench this turn, which is very efficient for just one energy on a basic Pokemon, but on its own it can fail to keep up with bulkier attackers that can also output a decent amount of damage. 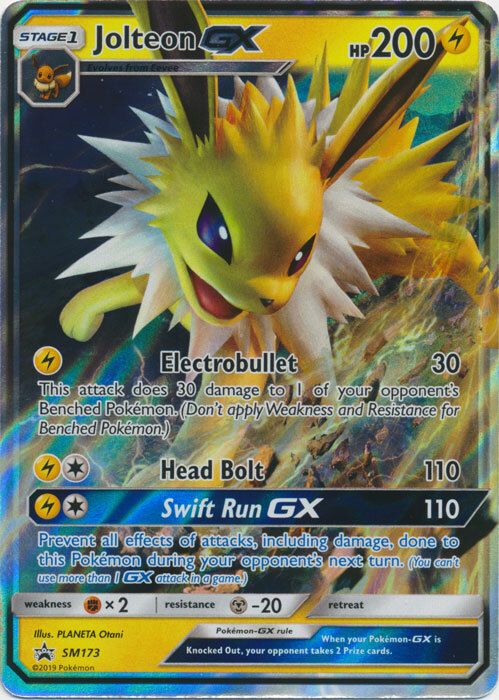 I am finding that Jolteon-GX’s slightly better damage output and the potential swing turn that the GX attack provides makes up for the somewhat underwhelming qualities of Zapdos. Zapdos/Jolteon-GX has the potential to be a very aggressive archetype. In this archetype, Tapu Koko-GX provides a nice option for a GX attack which can prevent Pikachu Zekrom Tag Team-GX from rolling through the Zapdos player’s board unchecked. 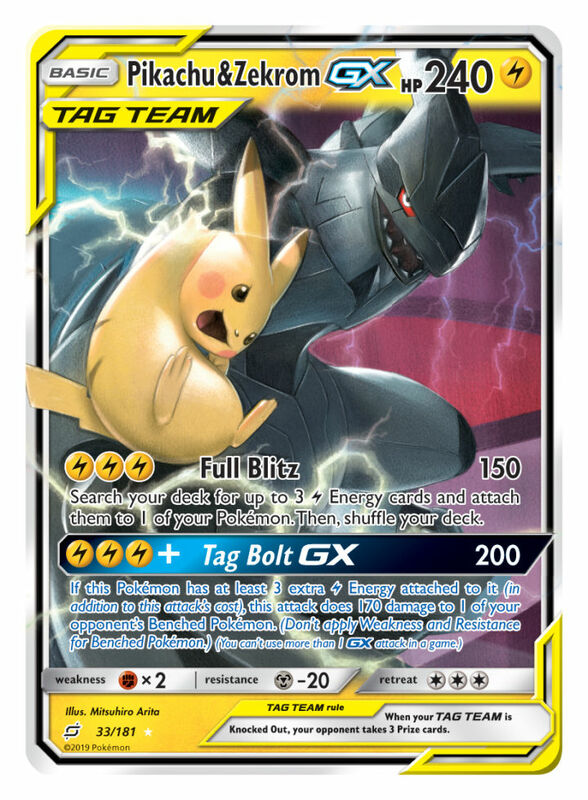 Pikachu Zekrom has a GX attack that is a reach to get to but is worth building a deck around. Since the GX attack has the potential to take 4 prizes in one turn, an efficiently powered up Pikachu Zekrom is well worth it. The attack needs 6 lightning energy attached for its full power or 5 lightning energy attached if Thunder Mountain Prism is in play. The ideal turn one as far as I have seen for a Pikachu Zekrom deck going second is: start Pikachu Zekrom as your active, attach lightning energy for turn to active, use Tapu Koko Prism Star to accelerate at least one energy to a benched Pokemon, Energy Switch that energy to your active Pikachu Zekrom, play Thunder Mountain Prism to reduce Pikachu Zekrom’s first attack cost to 2 Lightning energy, and then finally use Pikachu Zekrom’s first attack to accelerate 3 lightning energy from deck to itself. If you go first then you have more time to prepare Pikachu Zekrom for its first attack so it is a lot easier to get what you need and potentially have an extra energy attachment. Note that Lisia can make this even more possible by searching out both Tapu Koko Prism and Thunder Mountain Prism. Venasuar Celebi Tag Team-GX has potential as the attacking lead of a control deck built around keeping Venasuar Celebi healed while removing energy from your opponent’s Pokemon while doing moderate damage and inflicting annoying special conditions with Venasuar Celebi’s first attack. Venasuar Celebi’s GX attack can recycle your entire discard back into your deck and simultaneously heal itself completely which is huge. The viability of this archetype will heavily depend on the popularity of decks in the meta that can accelerate energy to achieve one hit knockouts on Venasuar Celebi. Snorlax Eevee Tag Team-GX will definitely see play in Malamar decks as the damage output of Dumptruck Press is very good against evolution Pokemon and its GX attack allows you to draw cards which is always welcome in Malamar variants as they can run out of steam late game. Jirachi could possibly be a nice boost of search power for Psychic Malamar and would naturally fit since Malamar runs Escape Boards and other switch cards already, but I like the way SUM-LOT Malamar has been running so much that I’m not sure how much I want to change up the list. Gengar Mimikyu is a possible inclusion for its GX attack. Using its GX attack in place of Chimecho’s Bell of Silence would completely halt your opponent for a turn at the beginning of the game allowing you another turn to set up, but I don’t think it will be an efficient replacement for Chimecho. Chimecho already stalls decks fairly well and does so with a single prize Pokemon. Gengar Mimikyu might be more trouble than it is worth as it would be using your GX attack for the game and doesn’t have the potential to stall your opponent for multiple turns in succession like Chimecho. Erika’s Hospitality is a nice new draw supporter option to try. I think Erika has a place in Malamar decks on the surface as it is easy to empty your hand when playing Malamar because your deck has 4 Ultra Ball, 4 Mysterious Treasure, Nest Balls, Malamars to evolve, and other cards that can easily be dumped out of your hand. Suprise, suprise. Zoroark GX is still great. ZoroRoc can possibly use Black Market Prism Star with Unit Energy and Weavile. Nanu is another new card that has potential for Zororoc. Whether or not these new cards are used, ZoroRoc should still be a staple of our Standard meta. OmniPoke recently made an interesting video on Zoroark-GX Control with the new Persian and Black Market Prism. The new Persian has some crazy potential considering the hand sizes opposing Zoroark decks could have. Persian would be used to remove any important resources you find in your opponent’s hand like stadiums and energies, so you would be free to keep your Black Market Prism stadium out while using Sableye every turn to stop your opponent from playing supporter cards and not giving up prizes if Sableye would be knocked out. If your opponent cannot play Judge, you can eventually win with Unown Hand or just wait for your opponent to deck out.